The visit of Russian Foreign Minister Sergey Lavrov to Washington sent Democrats and US mainstream media into a renewed frenzy, with many seeing a sinister connection with President Donald Trump firing FBI Director James Comey the day before. Democrats have sought to explain Hillary Clinton’s unexpected defeat in the 2016 presidential election with claims that Russia had somehow “hacked” or “influenced” the election at personal direction from President Vladimir Putin. Clinton herself also pointed to Comey, specifically his October 28 letter informing Congress that the FBI was reopening a probe into her use of a private email server to send classified information. The party has nonetheless expressed outrage over Trump’s firing of Comey, accusing the White House of doing so because the FBI was investigating its allegations of the president’s collusion with Russia. Russia’s top diplomat waded into the controversy during his visit to Washington on Wednesday. “Was he fired? You’re kidding!” Lavrov quipped, after NBC reporter Andrea Mitchell shouted a question about Comey at the photo-op with US Secretary of State Rex Tillerson. As he and Tillerson walked away, Lavrov shook his head. “Who was bringing you up? Who was giving you your manners?” Lavrov asked, with the remarks making it into the official State Department transcript of the event. Following his meetings with Tillerson and Trump, Lavrov held a press conference at the Russian embassy in Washington, at one moment sighing in exasperation at repeated questions from US reporters about alleged Russian “influencing” of US presidential elections. “The trouble is, no one has ever presented a single fact or evidence” of alleged Russian intervention to anyone, Lavrov said, adding that the issue was not discussed in his meetings in Washington. “I can’t believe I’m being asked to answer such a question, especially in the US, where you have a sophisticated democratic political system,” he added. “And now we go to Alaska,” Moscow’s top diplomat quipped at the end of the press conference, referring to the Arctic Council ministerial meeting on Thursday. Putin himself laughed off a question about Comey’s firing, when asked by a CBS reporter as he prepared to play a game of hockey in the Russian resort city of Sochi. 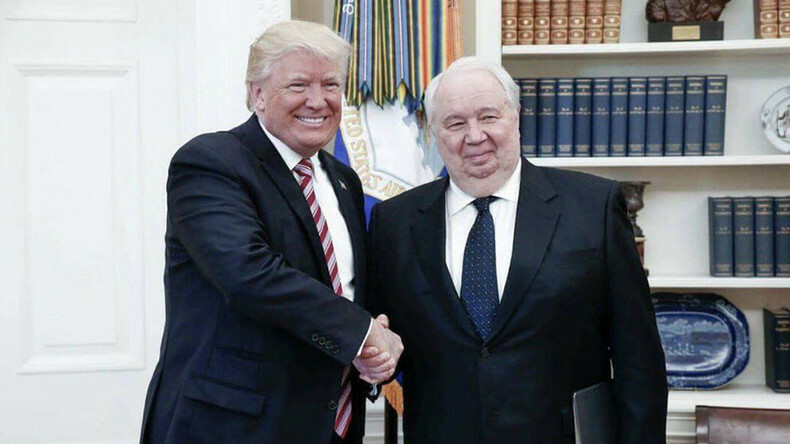 Meanwhile, US media bristled at the fact that the Russian Foreign Ministry released photos of Trump meeting with Lavrov and the Russian ambassador to Washington, Sergey Kislyak.